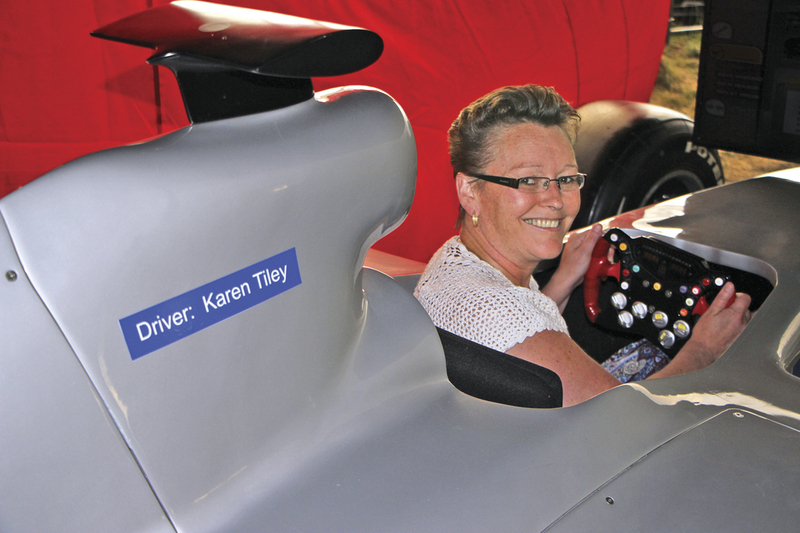 CPT’s Karen Tiley in the cockpit of the Formula One simulator which carried her name. A surprise appearance was made by the new Yutong CB12 city bus which had only been in the country a matter of days. ADL’s Enviro200 MMC demonstration bus. Possibly the most popular drive of the evening was the Wrightbus New Routemaster. Arriva’s exhibits included the Van Hool EX16H integral. Scania’s Interlink, the successor to the OmniExpress, made its UK debut. Two recent new options displayed were the Yutong CB12 city bus and the Sunsundegui SB3 Volvo B8R 72 seat school coach. 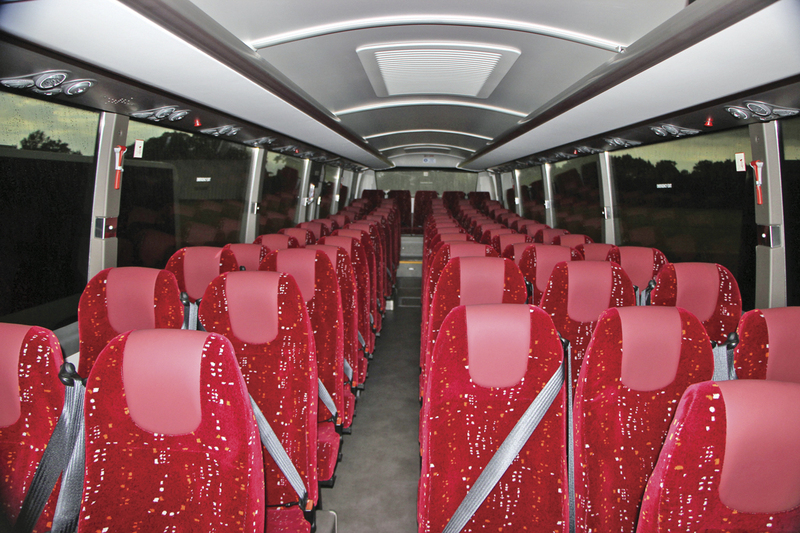 The Scania Interlink Finesse interior. Note the lower side window line and less sunken gangway. The Sunsundegui SB3 Volvo B8R interior. It seats 72. 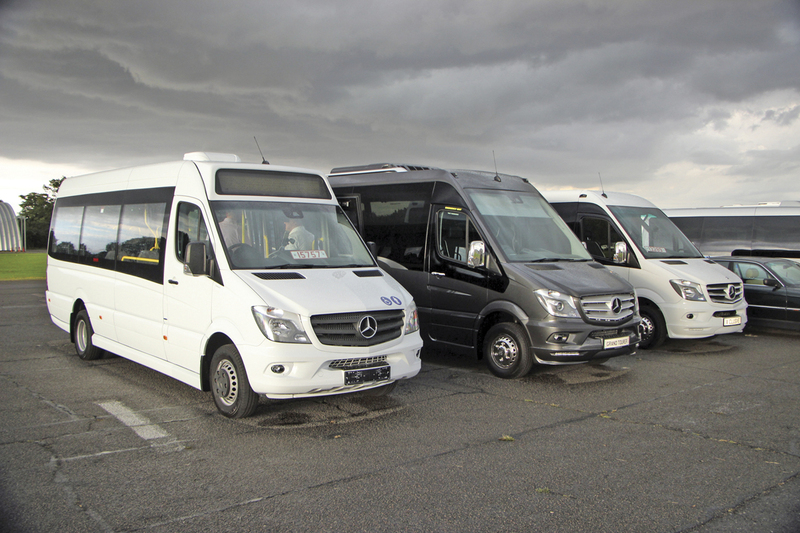 The EVM Sprinter-based line up included the Community low floor bus, the Grand Tourer and the X-Clusive. Minis to Midis showed the Otokar Navigo T, seen here on a test drive, as well as a Turas 900. Originally conceived four years ago by Robert Lodge of Lodge Coaches to attract CPT Essex members to an annual get-together, the North Weald Hog Roast and Ride & Drive event has grown to welcome CPT members from across the country. Dot Grainger has since taken over as Chair of CPT Essex with Bill Hiron as Vice Chairman but, as a committee member, Robert continues to organise the event working with CPT London and South East Regional Manager, Karen Tiley. Apart from the social aspect, it provides a stellar line up of manufacturer’s demonstration vehicles, a truck driving challenge and the chance to try Formula One racing in a simulator. This year’s was held last Friday evening and Stuart Jones went along to it. North Weald is a great venue for this kind of event because not only is it well located, there is so much space available for the vehicles and car parking as well as a short perimeter test track on which the buses, coaches and minibuses can be evaluated. This year is a significant one for the airfield, which remains fully operational, as it is 100 years since it was first established in 1916. That was pretty early in the days of aviation when you consider that the Wright Brothers didn’t get off the ground until 1903. In the Second World War, it was home to Hurricanes, there is still one displayed by the entrance, and famous pilots such as Douglas Bader. Those attending were hampered by accidents on the M11 and A14 that caused delays en route, a problem that also impacted on some of the manufacturers, but once people got there, their efforts were rewarded with more sunshine than rain. It really was an impressive turnout on the part of the manufacturers with the full promised complement of no less than 28 vehicles present and available for test drives. 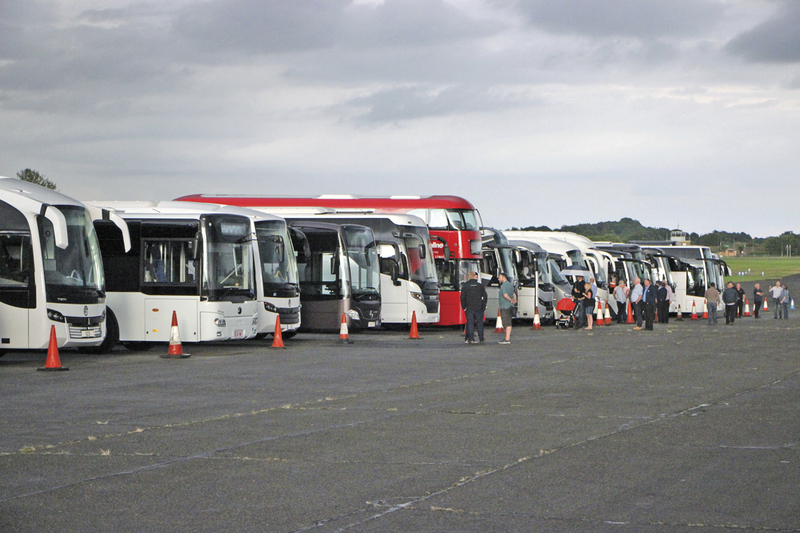 There was something for everyone, with an excellent selection of mini and midi coaches, full sized coaches from school vehicles to tourers, service buses and even a New Routemaster, loaned for the evening by Metroline. I cannot think of another time when there has been that kind of opportunity to physically compare so much hardware at one venue. I would like to have tried more myself but simply ran out of time and confess I have had to make quite a number of calls to fill in the gaps in my notes. A truck manoeuvring challenge was mounted by Sawbridgeworth based ACE Training, who also offer PCV training. This occupied two articulated vehicles with the prizes for the best male and female drivers going to Robert Sinott of Acme and Vicky Golding of Don’s of Dunmow respectively. For those who prefer their thrills a little more simulated, there was a Formula One car simulator based on a 2010 Mercedes-Benz. The site is run by North Weald Flying Services who also facilitated the event and provided catering. Throughout the event, tea and coffee was provided by the Squadron restaurant in addition to the bar located in a typical airfield Nissen Hut mess room. A collection was held for the local Essex and Herts Air Ambulance, which has a base on the site, and this raised £1,000. Everyone contributing £5.00 was given a ticket for the draw to win the rare opportunity to drive something with a gear stick and no synchromesh, one of Lodge’s Bedford OBs. I didn’t hear the result but I can imagine. It was won by Simon Archer of Arriva the Shires & Essex. The complete list of demonstration vehicles participating was: Close Brothers (Wrightbus Streetlite DF), EVM (X-Clusive, Grand Tourer and Community low floor bus), Minis to Midis (Turas and Navigo T), Dawsonrentals (Sprinter), ADL (Enviro200, Panther, Cheetah XL), Volvo (Jonckheere SHV, Sunsundegui SC5 and SB3), Scania (Touring and Interlink), Mercedes-Benz (Citaro K, Tourismo M and Tourismo), Yutong (TC9 and CB12), Optare Solo EV, Arriva Bus and Coach Ltd (Van Hool EX, Temsa MD9 and Safari HD), VDL Futura FHD2 and Irizar UK (i6 and i4). In addition, there was the Wrightbus New Routemaster, and Lodge Coaches’ Bedford OB. 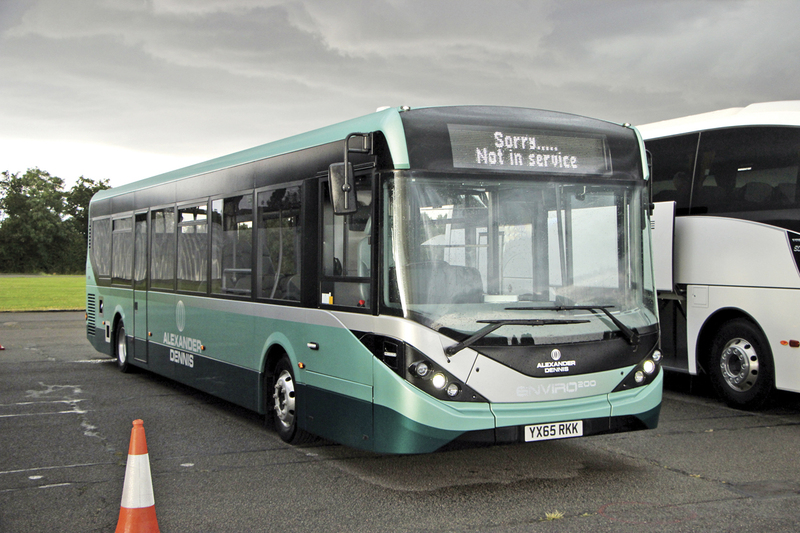 Attractively finished in a two tone green, silver and black demonstration livery, ADL’s Enviro200 was shown in 11.5m 40-seat high-specification form (more seats are possible) with Cummins Euro6 four-cylinder engine and Voith transmission. 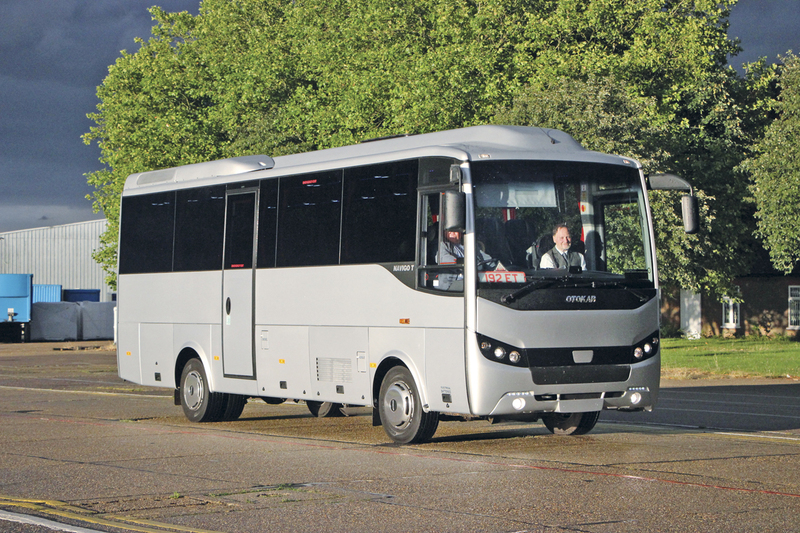 Making a surprise and unheralded appearance having been driven south by Pelican Sales Manager, Bob Elliott, was the completely new right hand drive 12m Yutong CB12 city bus (badging says ZK6126HGA) which has just been homologated for the UK. A shorter 10.8m version will follow as will an electric version. Four electrics are already running in Paris, I was told. The bus shown was a white single door bus with Cummins six-cylinder Euro6 engine and ZF EcoLife transmission. The interior was very Chinese in appearance and production vehicles will not feature the same seating or quite the profusion of handrails found in this bus. Seating capacity was shown as 41+28+1 or 43+27+1. The exterior side panelling will also not be in one piece as it was on this bus. No price has yet been announced but it will be under £150,000 with air conditioning as standard. The frame should last well, all Yutong products have electro-plated steel frames. On a test circuit, once I had pressed the three buttons in the correct order and for long enough to achieve ignition, the performance was good. There was one quite rough automatic gear change but it was otherwise smooth, the steering was good and it didn’t rattle on the concrete roads any more than anything else. Leaving the cab I found the cab door did not open very far, something that is to be addressed. Simon Matthews of Close Brothers was kept busy demonstrating the 10.8m Wrightbus Streetlite DF. This is powered by the Mercedes-Benz OM934 four-cylinder engine and is immediately available to rent. It’s not often that you get the chance to try a full electric bus though sadly I ran out of time to do so in the Optare Solo SR EV. The bus shown was a 13-plate example but incorporated an extended range capacity. Energy storage is in two parallel battery packs, each electronically monitored with 26 lithium iron magnesium phosphate batteries, giving total energy of 92kWh. Voltage is 333 volts DC nominal. For charging, two 7.5kW integrated onboard chargers connect to a standard three phase supply. The 10.6m Mercedes-Benz Citaro K is the smallest member of the Citaro family. This particular bus has had a fairly long life as a demonstrator, having started the role in 2014 and amassed over 80,000 miles on the clock since then. As shown it was certified for 32 seated and 40 standing passengers, though achieving the second figure would be a squeeze. The engine was the six-cylinder OM936 unit rated at 295hp/220kW coupled with a ZF EcoLife box. I found it very smooth to drive, but, unfortunately, I found I couldn’t get out of the cab afterwards until someone showed me the switch that released the magnetic door catch. Nine dual door examples are in build for RATP owned Epsom Coaches, the Isle of Man having taken four earlier this year. I couldn’t resist a drive in the Wrightbus New Routemaster, my first, and being careful to allow for the longer wheelbase compared with most of the capital’s buses found it a really easy drive. Acceleration was very good and throughout the journey it was as smooth as you would expect with a hybrid. A genuine surprise was the UK debut of the new Scania Interlink Finesse, which improves upon the OmniExpress, the model it replaces. Built at the same Finnish plant, the model shown was a 12.8m two-axle K410EB4x2 with 410hp engine requiring SCR but no EGR, coupled to the GR875R two-pedal eight-speed OptiCruise automated gearbox. This was a 53 seater with toilet but a tri-axle with 63 seats and toilet is also offered. Finish was to the Finesse standard, slightly higher than standard, incorporating features such as uprated seats with half leather and piping, USB sockets and a Webasto pre-heater. The reversing camera, that could perhaps be a little quieter in operation, is standard across the range, as is adaptive cruise control though there is no legal requirement for it to be. Though it had its adherents, there were criticisms of aspects of the OmniExpress design that the Interlink seeks to address. The key ones are that the side window line is 10cm lower with the windows 10cm deeper, the deep gangway well with a high step to the seats is now shallower and the climb much reduced, the mirrors are revised and the considerably different styling is, to my mind, much improved. Evidence of just how new it was could be seen in the 240.2 miles on the clock (may even have been kilometres). The NDR buttons for the automated gearbox are on a steering wheel stalk to the right, which I initially found confusing, but the steering and driving position were very easy to adjust and it was very easy to drive. Perhaps I should have checked out the new ‘Your Scania Coach’ app beforehand, a free download for Apple and Android that is designed to help drivers become familiar with their new coach. I understand Interlink orders have been taken already but neither these or the prices are being announced yet as it won’t be officially launched until the NEC Show. Also shown was a 12.1m K360IB4x2 Scania Touring HD with Chinese Higer body featuring 49 recliners, toilet and Webasto. A straight 53 seat version will soon be added to the range. Sporting a large Union Jack in shades of grey and black, ADL’s Plaxton Panther 3 bodied Volvo B8R was a real eyecatcher. Previously seen at the UK Coach Rally, it featured air conditioning, a centre demountable toilet and 53 Brusa recliners, though up to 59 can be installed if the toilet is demounted. The B8R had the 350hp D8K Euro6 engine and Volvo’s I-Shift automated transmission. Accompanying the Panther 3 was a Plaxton Cheetah XL with 36 Brusa recliners. This was mounted on the 10.5-tonne Mercedes-Benz Atego chassis with 230hp four-cylinder engine. Volvo demonstrated three coaches drawn from stock. Mounted on the B11R chassis was a 12.6m two-axle Jonckheere JHV with 420hp engine and I-Shift automated transmission. This seated 53 and was equipped with a centre toilet, retailing at £255,000. Both of the other exhibits were Sunsundegui bodied and mounted on B8R chassis. The SC5 is Volvo’s midi offering offer either 41 seats or, in the form shown, 18 and a toilet. This has the 350hp version of Volvo’s D8K eight-litre unit and can be supplied with either ZF automatic or Volvo I-Shift transmission. It retails at £230,000. Making a first appearance was the new Sunsundegui SB3 which is 12.25m long and offers 3+2 coach seating for 72 passengers. Described by Volvo as ‘a coach for all seasons’, it is equipped with roof mounted Eberspacher air conditioning, and is powered by the 320hp output D8K engine and ZF EcoLife automatic transmission, retailing at £205,000. Representing the Mercedes-Benz coach range were Touring versions of both the three-axle Tourismo M and two-axle Tourismo. The 13m M had 57 TSE+ seats and toilet, ZF automatic box and 400hp OM470 engine, while the 12.2m coach was a 49-seat executive. This also had a ZF auto gearbox which represents a £3,500 cost over the standard Powershift automated manual. 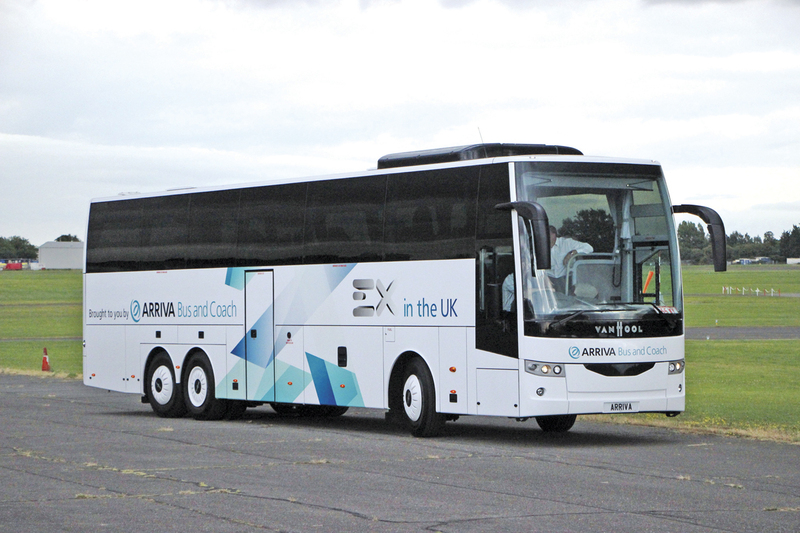 Arriva were present with three of the products they offer, though not the Van Hool TX family. Kept busy was the Van Hool EX16H tri-axle demonstrator and former show vehicle which we tested earlier this year. This featured a 435hp Paccar DAF MX11 Euro6 engine and ZF EcoLife automatic gearbox. 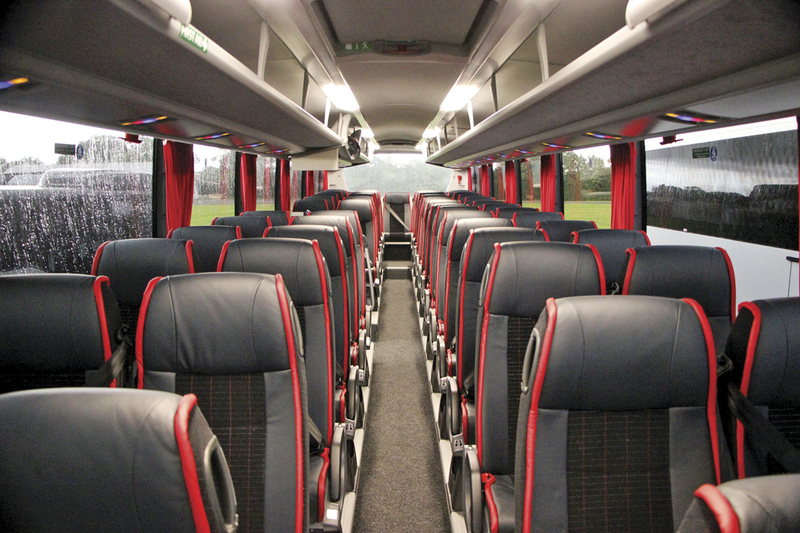 Examples are available from stock with 57 seats and toilet at £260,000. From the Temsa stable, there was the Safari HD with Euro6 Paccar DAF MX11 368hp engine and ZF EcoLife transmission. It seated 53 and had a toilet, retailing at £218,000. Little brother of the Safari, Arriva’s Temsa MD9 was debuting at this type of event and was a popular vehicle. 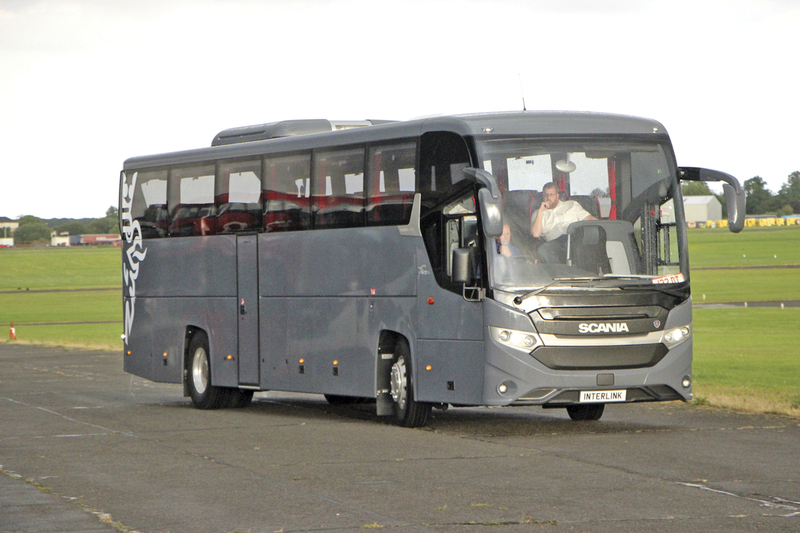 It was shown to Executive specification with 34 seats and courier as well as a floor mounted toilet. A 39 seat Maxi option without toilet is also offered. Equipped with a six-cylinder Cummins unit rated at 280hp and a ZF EcoLife gearbox, the Executive retails at £163,000. 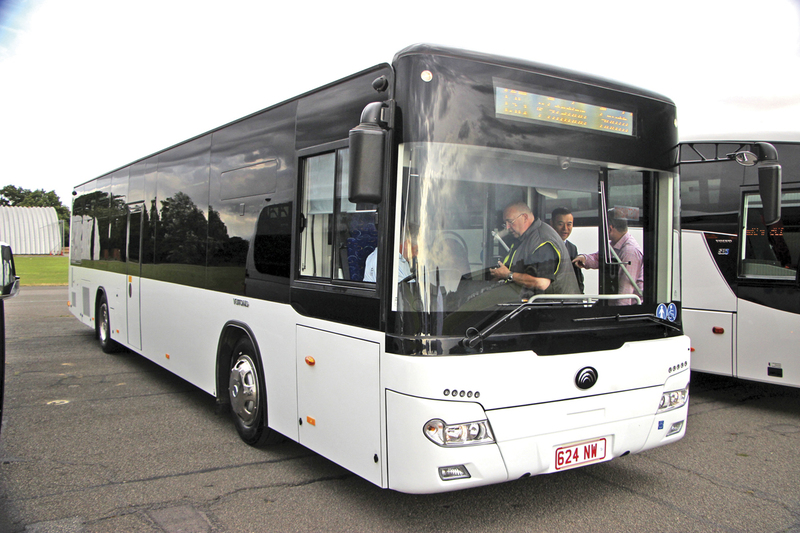 Moseley (PCV) took along a stock 12.9m VDL Futura FHD2-129-370MX11integral in white. Retailing at £269,900 + VAT, this was to an enhanced standard specification featuring the Paccar DAF 370hp/270kW MX11 engine and ZF EcoLife 6AP-1700B fully automatic six speed gearbox with retarder. With an offside centre sunken water flush toilet and Bosch Professional Line multi media system, it had 57 Vogel Magnio recliners trimmed in blue Felicita with grey Dakota leather piping, headrest covers and seat side faces as well as smoked oak effect vinyl floor covering. Enhancements included Xenon high and low beam headlamps with washers, leather trimmed driver and courier seats, a leather steering wheel and a driver’s storage compartment. 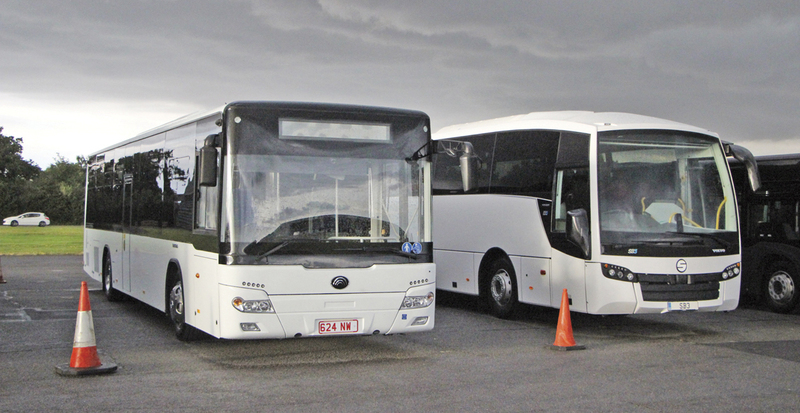 Irizar showed two stock coaches reporting good levels of interest and useful leads. The 12.9m i4 was a ZF EcoLife automatic with Paccar DAF MX11 369hp/271kW engine rather than the 330hp unit usually installed in the i4 and 70 Prime Passenger Seating Buckingham seats with all age belts. It retails at £205,000. Also 12.9m on two axles, the i6 featured the same driveline and accommodated 53 and a toilet. It retails at £235,000. Those hoping for a go in the new i8 will have to wait until the forthcoming Rockingham Speedway event on 16 August. EVM were first time exhibitors and found it a very enjoyable event. They showed three stock vehicles based on the Mercedes-Benz Sprinter. To their surprise the one that attracted the most attention from operators keen to assess options for service route applications was the Sprinter Community Low Floor with wheelchair access. A number of demonstrations have been arranged for the weeks ahead. It had 16 Kiel Ligero passenger seats with height adjustable belts, seven of them in the low floor area. Other features included large panoramic double glazed windows, ducted air conditioning, USB charging ports, bell pushes, a coach type back end with large window, Hanover front, side and rear destination equipment and a Masats fold out ramp. It retails at £85,000+VAT. Also present were the new Grand Tourer based on a Sprinter 519 V6, the body of which is built in Manreas by CarBus. 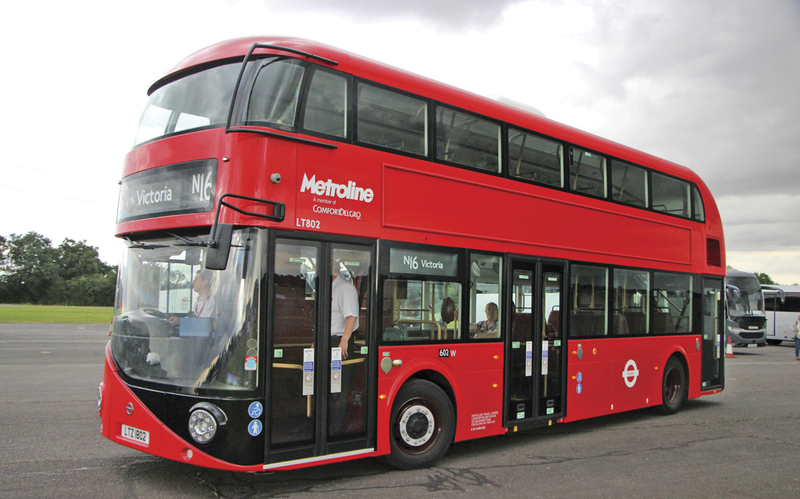 Double glazed and finished in metallic grey, it seated 20 passengers with air conditioning, a monitor and DVD, fridge, a USB connection at each seat, two side lockers and a large boot. The retail price was £92,500 + VAT. Based on the Sprinter 516 was the 17 passenger seat EVM X-Clusive. This has panoramic double glazed windows, a panoramic glass roof and a panoramic front screen. As well as a large boot it has a monitor and DVD, USB points at every seat and air conditioning. It retails at £75,000 + VAT. Dawsonrentals also sent a new 16-plate Sprinter with EVM Elegance conversion. It was based on the Euro6 Sprinter 516Cdi with 163bhp engine and seven-speed G-Tronic gearbox. Minis to Midis showed both the Atego 921 based coachbuilt Turas 900 which can seat up to 33 passengers and the 8.4m long Otokar Navigo T. Both the Turas and Otokar brands are distributed in association with the Irish dealer, Brian Noone. I drove the Navigo T which was a standard 37-seater with Cummins 180 engine and a retarder equipped Allison transmission with rather old fashioned throttle style control. It drove well, the biggest problem I encountered being the spokes of the steering wheel obscuring the control stalks when I wanted to turn on the wipers. Steve White told me that Navigo sales were already in double figures, with customers including Ambassador South of High Wycombe, Spot Hire of Kent, Hardings of Bletchworth and Tilleys of Cornwall. The Navigo T is priced at £109,000. Apart from the new CB12, Yutong demonstrated a Euro6 TC9 midicoach, a model that has surpassed expectations of it with over 100 now sold. Although you can have a 32-seater with toilet or a 37-seater with an extra seat squeezed in on the offside, the standard configuration is 35 seats and it was this that appeared at North Weald. I found the steering a little heavy but at least two operators I spoke to while there already have examples and are very happy with them, with no complaints at all about the driving. I understand the hog roast was excellent and greatly enjoyed by most of the 200 who attended, though unfortunately I spent so long looking at vehicles and trying them out that by the time I got there it had all been eaten. Fortunately there was some cake left. Definitely something wrong with my priorities there! I thought this was a great evening and some visitors were still sampling the vehicles after the sun had set. I’d thoroughly recommend that anybody who gets the chance to attend takes it up next year.